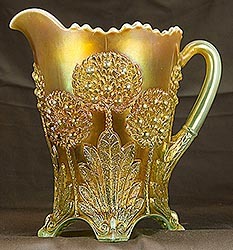 One of Fenton's most popular patterns, Orange Tree was produced in a great range of shapes. Only the plates, bowls, and mugs, however, are found in much of a color range. 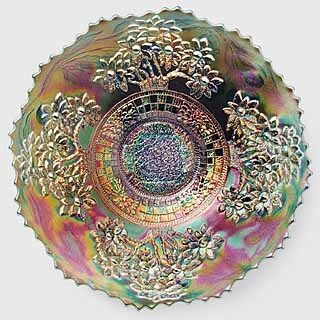 Some of the plates and bowls have an alternate center in which the trunk of the orange trees seems to skip the interior band and continue slightly into the center. The blue plate above left shows such a variant (and it's found more often in plates than bowls). 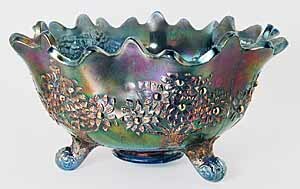 A rare variantion of the bowls has a daisy pattern in the center band rather than the alternating basketweave and floral design. 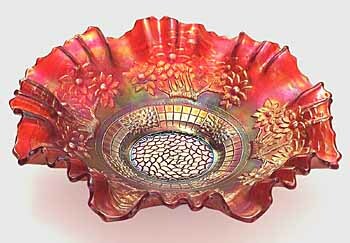 The three-in-one edge, as shown in the above red bowl, is very rare in Orange Tree. 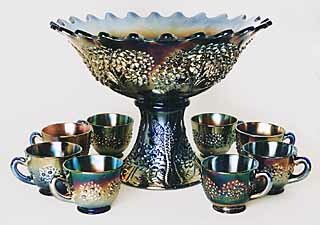 The Orange Tree pattern has been used by Fenton on a number of contemporary pieces, including bowls. 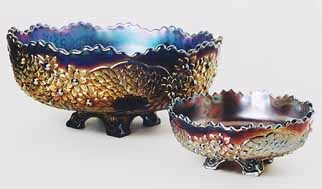 Fruit or orange bowls have three scroll feet and measure 10 to 11 inches across. The berry sets are made from their own unique molds and have four square feet--which are almost always damaged. Pitchers and tumblers all have four feet, which are highly succeptible to damage. 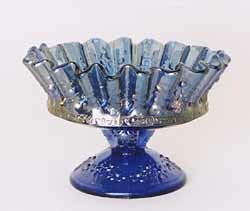 The flared versions of the punch bowl, as shown above, are more desirable than the ruffled examples. Variant tumblers do not have the scale band connecting the top orange trees. 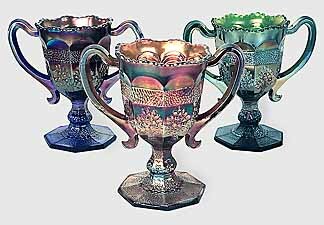 The Orange Tree loving cups are unique--they are not known in any other pattern. 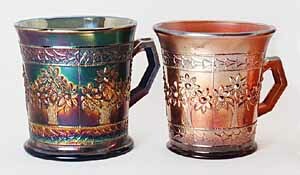 Orange Tree mugs are found in two sizes; the shaving mug as shown on the left with a 3 inch base, and the standard mug with a 2 1/2 inch base. 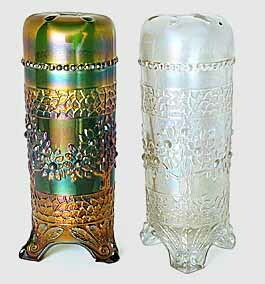 Hatpin holders and powder jars are the only items specifically produced in the Orange Tree pattern for the lady's dressing table. 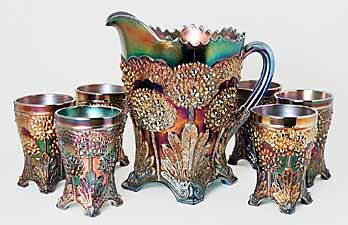 Table set pieces are quite rare in this pattern, and few complete table sets are known. 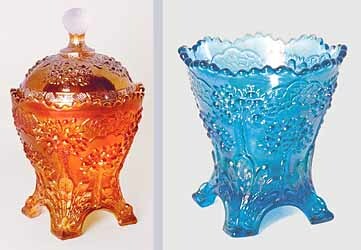 Above are a typical marigold covered sugar bowl and a spooner, particularly unusual in that it is celeste blue. 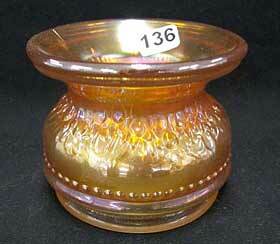 This unique Orange Tree spittoon in marigold, made from a powder jar bottom, sold in 2007 for $6,700 (Photo courtesy of Wroda Auctions). 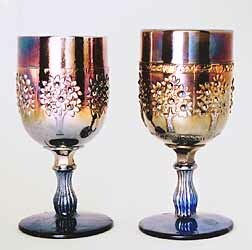 Above left are two wine glasses, the regular and the scarce variant. The variant, which brings about the same price as the regular, is a bit taller and has an additional band just above the pattern. On the right is the sauce (sometimes referred to as a sherbet). This one is unusual in that it is crimped. A similar one sold for $55 in 2000.